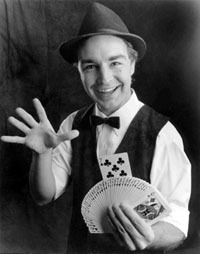 This magician has been producing smiles and laughs with his magic for the last ten years. Known as the "Doctor of Magic", he has studied in Europe with Cellini, and New York’s Slydini. In some of his close-up routines, he uses cards, coins and money. He is the holder of the 1st place in Arizona Close-up Magic Championship.